GoDaddy CEO Bob Parsons may need a lesson in online reputation management. Lesson 1: Don’t kill elephants. Lesson 2: If you do kill an elephant, don’t post a video about it on the web. 3: If you do kill an elephant and post a video about it on the web, and then tweet it out to 33,000 followers. Really lesson 1 solves them all, but now he’s learning the hard way as the controversy has taken the web by storm. Tell us what you think about the situation. Then it goes to a series of still photos of Parsons posing proudly with the dead elephant. “Early the next morning hungry villagers butcher the elephant,” it then reads, before cutting to footage of the villagers butchering the animal while AC/DC plays over it. Some villagers wear GoDaddy hats. He even tweeted it. Brilliant. The video currently has over 20,000 views, with many more sure to come. You can wade through pages of comments here. Many people say they will be pulling their sites from GoDaddy. Even PETA was using GoDaddy, and is obviously putting a stop to that. PETA, points out that Parsons has also killed a leopard. Parsons is hiding behind the lame claim that killing elephants helps farmers in Africa whose crops are damaged by the animals. In fact, there are ample effective and nonlethal methods to deter elephants from crops, including using chili-infused string and beehives on poles to create low-cost “fences.” Instead of coming up with flimsy excuses for killing these highly intelligent and social animals, Parsons should use his wealth to fund humane solutions to human/elephant conflicts. Oh yeah, and lesson 4: don’t post videos of leopard killing to the web. And lesson 5: Issue a company press release following the uproar. So far there hasn’t been one posted to the GoDaddy news center since 03/23. 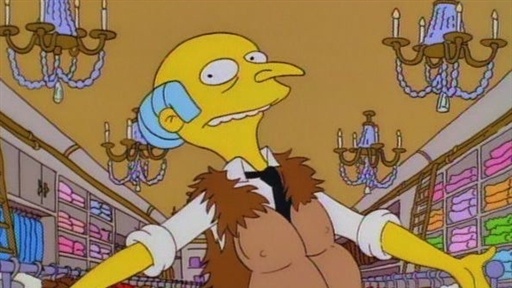 Is this guy the real Mr. Burns? Update: Parsons has been talking since this article originally ran. What do you think of Parsons’ actions? Comment here.